Prince Harry isn't first in line for the U.K. throne. But he could be one of royalty's biggest gamers. In an interview from The Daily Mail (via MCV), Prince Harry talked about his experience serving in Afghanistan. He also discussed his preference for gaming, playing sports, or flying helicopters. 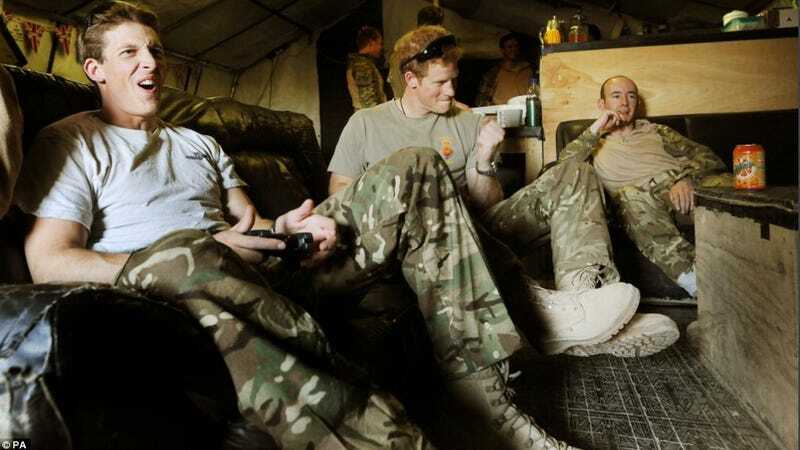 "You can ask the guys: I thrash them at FIFA the whole time," said Prince Harry. "Exams were always a nightmare, but anything like kicking a ball around or playing PlayStation—or flying—I do generally find a little bit easier than walking, sometimes." "It's a joy for me because I'm one of those people who loves playing PlayStation and Xbox," continued the prince. "So with my thumbs I like to think that I'm probably quite useful." The 28 year-old Prince, known as Captain Wales in the service, flew an Apache attack helicopter. When asked if he had killed anyone, the Captain said, "Yeah, so lots of people have. The squadron's been out here. Everyone's fired a certain amount." The British press seems to be focusing on the fact that the Prince has apparently killed while in service—which seems somewhat unfair to dwell on. He was an attack helicopter pilot. His job was to, well, attack. "Take a life to save a life, that's what we revolve around," Prince Harry added. "If there's people trying to do bad stuff to our guys, then we'll take them out of the game." "I'm not here on a free pass... our job out here is to make sure the guys are safe on the ground and if that means shooting someone who is shooting them, then we will do it." As most members of the armed service will point out, video games—whether they are Call of Duty, FIFA, or Warhammer 40K—are a way to unwind and bond with fellow troops. Prince Harry probably felt right at home.